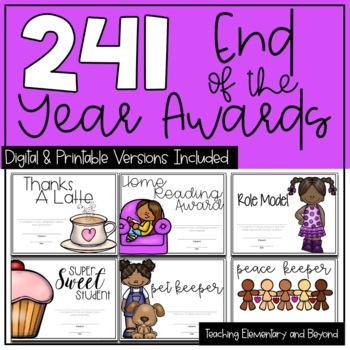 This product now includes 182 different awards (8 are customizable by you to make them unique for your class) which allows all of your students in your classroom to earn an individualized award at the end of the year. Some awards can be used all year long. Most awards are for the end of the school year. Each award is a full page and in color. They all look amazing even if they are printed in black and white. FYI: Two awards will use a lot of ink (librarian & environmentalist). 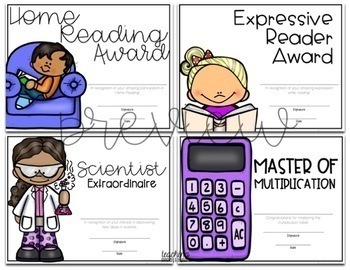 Descriptions of each award are generic so they are amazing for school but are also flexible to be used for other purposes (e.g., camps or clubs etc.). American & Canadian spelling included where needed. The font used is KG Miss Kindergarten. Any font will work though. 3. 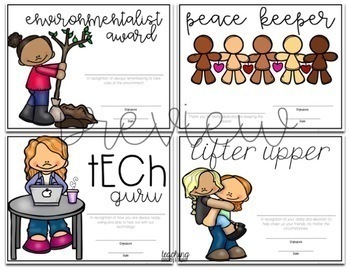 Table of Awards (7 pages) with a fillable column to help you keep track of which awards you will give to your students. This file also includes editing instructions (fonts used and where to download for free on TpT) if you should want to keep the fonts consistent with the awards. Want to see more? Take time to explore! I appreciate you taking the time to preview this item. If you have a problem or find a discrepancy I would LOVE if you would email me at teachingelementaryandbeyond@gmail.com before leaving a rating.